Now, I did give you all a sneaky preview of my cover for February in my last post, but it's just too pretty not to feature again. I love how minimalist this page is. I really like having the dots in the background, and the calligraphy centred in the middle. Yes, okay, it kind of looks like I've spelled February wrong, but blame my penmanship skills! What you might not have seen, (unless you follow me on Insta @rawrrbecca) is my monthly spread for February - which I adored! February is my birthday month so I thought yolo let me trace this fabulous unicorn here because it's pretty. I really like this geometric art style. I gave myself a pat on the back for the 'feb' open calligraphy too. As you can see, the calendar itself is very basic. I like the fact it's only got horizontal lines to break up the weeks, I think it looks very clean. I thought about adding goals or a to-do list to the spread like I did in January, but decided against it. February is always a hectic month for me and I didn't want to put any extra pressure on myself. 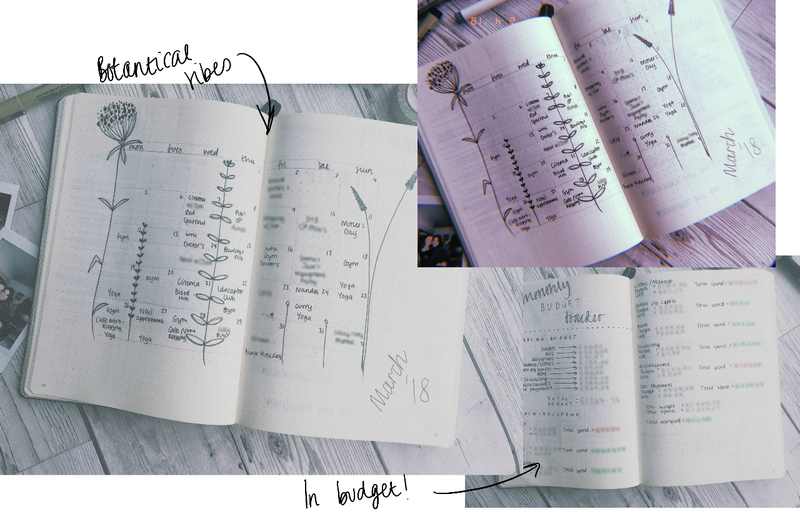 This was the month I finally seemed to get to grips with a budget tracker. I was inspired by Amanda Rach Lee (who btw, is a bullet journal goddess, literal goals) from a video she did for students. You can watch the segment on her budget tracker here. I've adapted it a little to suit my needs (I also use an app to keep me in check throughout the month - post on that soon) but I really enjoyed seeing my expenses written down, and using colours to quickly identify which areas I was overspending in. Unfortunately, I went a little over budget back in Feb, but I set this right by the end of March! As I mentioned earlier, throughout February I used the same weekly spreads as I had throughout January. I love the layout because they're simple and quick to draw and make it so easy to see what's going on that week. I had a lot going on in February and was super stressed out with a few things, which I think is why I didn't try any other weekly spreads at the time. Didn't make for good blog content but it did keep me sane for those few weeks! I think that this will be my default weekly spread. 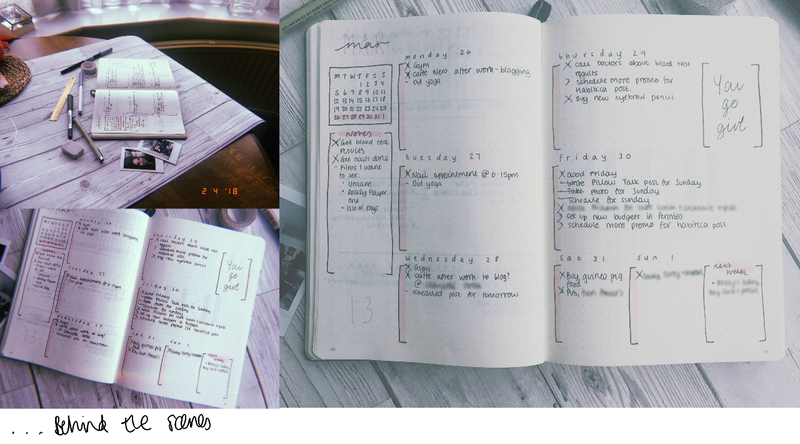 If I'm feeling uninspired or know that I'm going to be super busy, this layout will make an appearance! Here's my March cover photo. I'm not in love with it but it's different to anything I've done before so I like it in that respect. I felt a little bit lost at the start of the month in regards to whether I should have any kind of theme to the month. March is typically the time of year where I ditch the jumpers, whip out my denim jacket and start asking Jim to come on strolls around the park with me. This March was different though, we had a week of heavy snow to start with, and then two weeks in, even more snow! Don't get me wrong, I like a bit of snow but not at the end of what feels like an eternal winter. 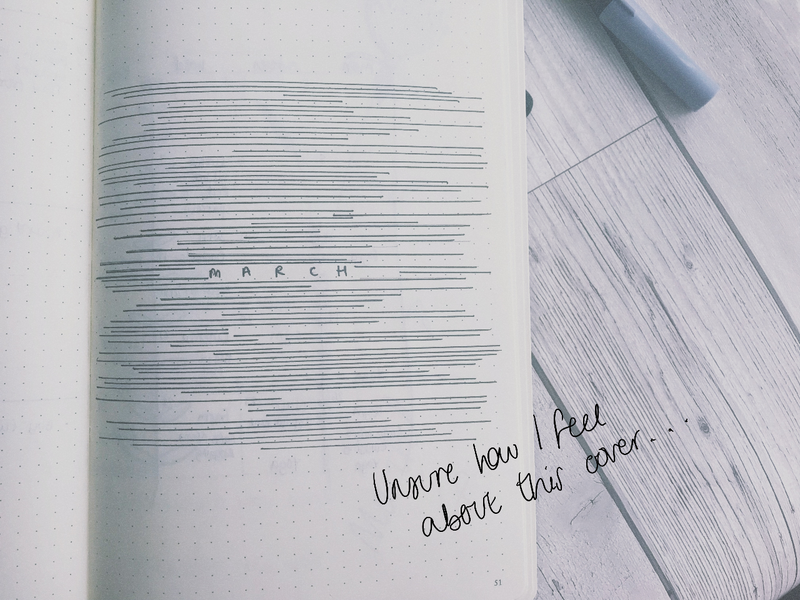 To counteract this blue feeling, I started the month with a different kind of monthly spread than I am used to. I penciled out a grid to start with, then went in and drew some different plant life to act as the dividers between days of the week. I left the pencil lines because I liked how it looked. It was a little more decoration than I'd had for a while but I liked it. My choice of plants did make events happening on Wednesdays and Thursdays a slight struggle to fit in, but I like it none-the-less. 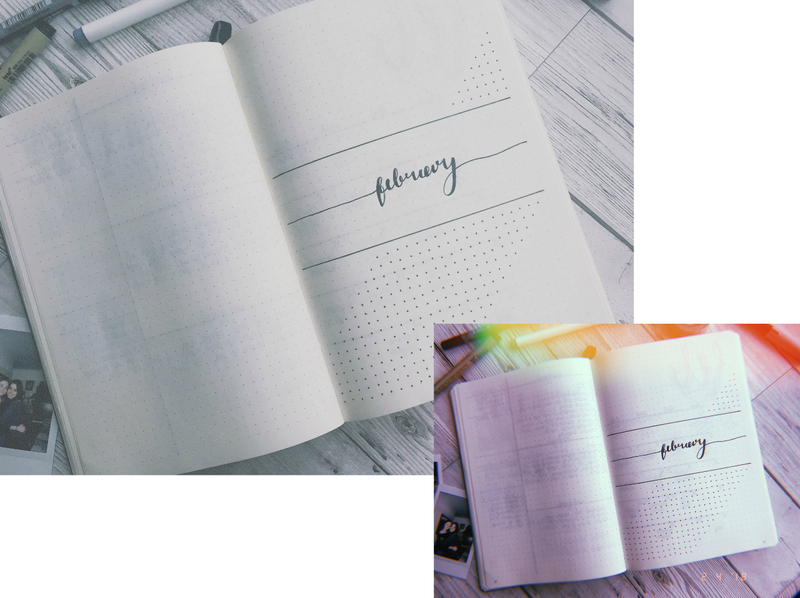 I followed this monthly spread with a budget tracker, exactly the same as February, and was very pleased that despite a bit of overspending here and there, I'd underspent in other areas so came in on budget. My savings account will be happy. Woah, you made it through the big one! I had more fun that I probably should have putting that little bullet journal collage thang together. Due to reasons I'm not really sure of, I actually missed a week towards the beginning of March, but carried on the following week like nothing had happened. I wasn't until I was taking photos I actually realised! After keeping it very samey in Feb, I decided it was time for a switch up. 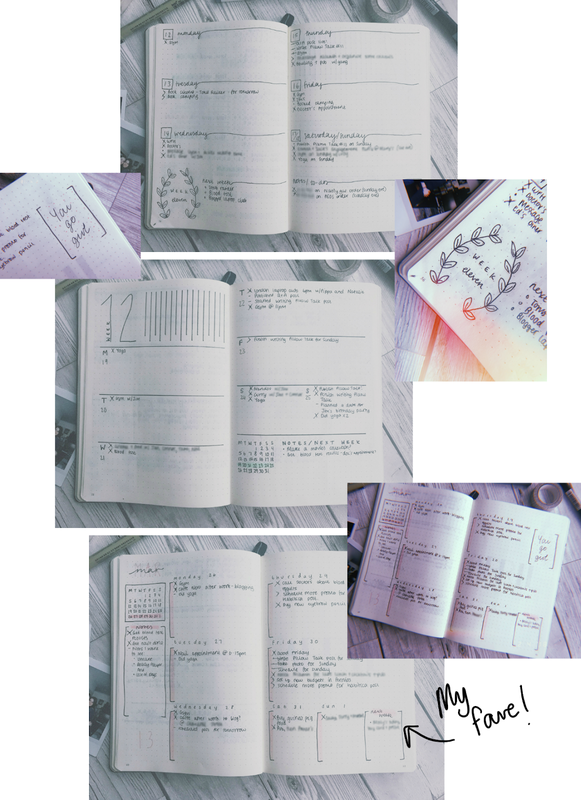 I'd been traipsing through Pinterest and Instagram looking at various spreads and came up with the following. I really really like this spread as it took me a grand total of five mins to draw out. I didn't use a ruler (I might have to divide the page, but didn't draw with it) and like the little bit of decoration in the corner. I enjoyed this weekly spread because it still gave me a lot of room each day to write whatever I needed too, plus I had room for notes/a plan for the following week. I did miss having a mini monthly calendar though. I definitely could have added this, I just didn't think of it until it was too late! I'm still undecided about how I feel when I look at this page. The vertical lines were a bit of a throwback to my cover page, and I liked the minimalist look, but it just didn't grab me. It worked but I'm not crazy about it. Thoughts? The week I loved! Now, not to be dramatic here but I used a considerable amount of colour on this week compared to the rest of my bullet journal. I liked it a lot though, and will definitely be giving this spread another go sometime! I love this spread because it's rough and ready. Again, no rulers were used, you can tell by the face the boxes at the bottom are slightly smaller, oops. I really liked the way each section was separated, I really like the colour. I really liked all of it. It's got everything I want! A notes section, a bit for things happening the following week, room for a motivational quote! Plus each day has its own section. #loveit. Do you like my cheeky lil behind the scenes shot? That's where the photography magic happens! Yep. It's not a real floor! 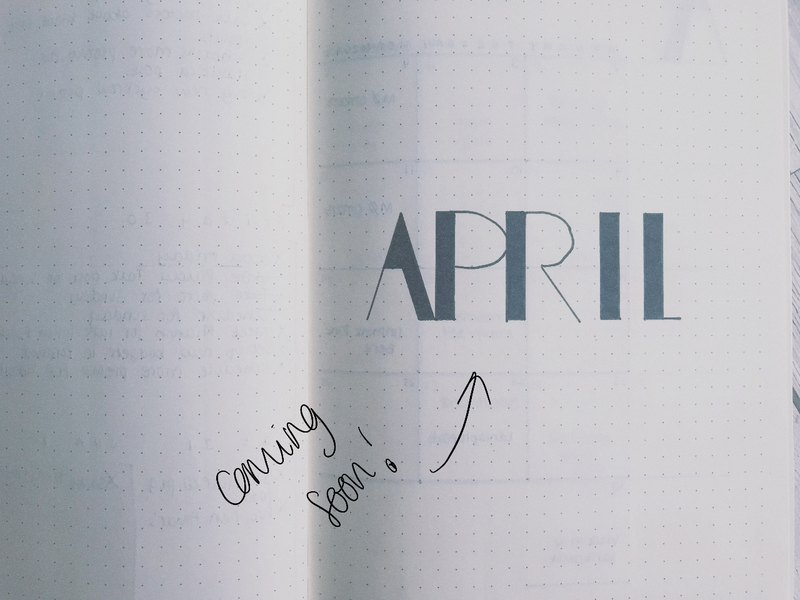 That brings my March pages to an end, meaning it's time for one thing... my April cover! What do you think? I really like the letters individually but don't think I've got the spacing quite right. I think I'd like to add something to this page before the end of the month. It's just not sitting right with me so far. I might try and do something a little similar to February. What I am loving is my monthly spread and first weekly spread for April. I am very happy with them, but you're going to have to wait a little longer to see them! If you're lucky you might be able to spot them on my Instagram. If you made it this far, thanks so much for sticking around! I have spent a lot of hours on this post. I really love bullet journaling and wanted to make this a little bit extra special to show that!